Much was done at the capitol this week. Please take time to click and read. If you have questions or comments please send me an email I would love to hear from you. ATLANTA – The Georgia House of Representatives’ Committee on Assignments named State Representative Dale Rutledge (R – McDonough) to the Agriculture & Consumer Affairs; Judiciary; and Regulated Industries committees. For more information about the Committee on Assignments and a complete list of all House Committee assignments, please clickhere. The landslide election results from Tuesday evening clearly show the confidence voters have in me. I am very humbled and grateful to my supporters for this overwhelming victory. The margin of victory clearly indicates the district’s desire for new leadership. My message throughout this campaign has been to restore trust within our district and ethics reform. I am looking forward to putting my words into actions at the Capitol. I am so thankful for my supporters and volunteers who have stood by me throughout this campaign. It will be an honor to serve this community as your next State Representative. Please know that I am available to you and want to hear from you on the issues that concern us. I look forward to working with those in the State House to make our district and Georgia the best it can be. McDonough- July 17, 2012: On Monday, July 16, 2012 the Steve Davis campaign stooped to an all new low. Davis’ campaign sent out an automated call from Dale’s eldest sister to District 109 voters claiming Dale “tore his family apart” and that he “could not be trusted”. The accusations made against Rutledge are blameless and a desperate attempt by a desperate politician who will do anything to keep his hand in the taxpayer’s pockets. This claim stems from a displeased sister over a private family matter within the Henry County Probate Court. Rutledge’s mother has Alzheimer’s and he and his youngest sister took steps to make sure the money earned by their parents’ hard work all of their lives would be available for the remainder of her life while she battles this terrible disease. Dale’s campaign throughout the election has focused on ethics reform and bringing trust back to the voters in the 109th District. This type of unethical and immoral behavior is exactly what the campaign has referenced during this election. Dale grew up on a family farm in Henry County, graduated from our public schools and attended Georgia Southwestern University. He has created two successful businesses and raised a family here. He is the former owner of Rover, Inc., a customer-friendly recycling and sanitation firm focused on the people of Henry County. Today he runs Expo-Link Cargo, a firm he started in1999 specializing in trade show exhibits for the logistics industry. Dale is a long-time member of the Henry County Chamber of Commerce. Dale and his wife of 26 years, Kathy, have two daughters, Caroline and Morgan. The Rutledge’s belong to McDonough Presbyterian Church where Dale has served as an Elder and Deacon. McDonough – July 11, 2012: On the day before a front page Atlanta Journal-Constitution story exposed State Rep. Steve Davis spending campaign contributions on personal expenses, the July 9 deadline for reporting contributions and expenditures made it clear that challenger Dale Rutledge has the overwhelming support of voters in the 109th district while Davis has the support of lobbyists, Political Action Committees (PACs) and other Gold Dome insiders. While Dale reported 124 individual contributions from voters inside District 109, Davis reported just two. Local citizens contributed $29,158.00 from those individual voter donations while the incumbent raised $225.00 from inside the district. Rutledge’s average contribution from within the district was $235.15. Davis has out raised Rutledge’s campaign by a two-to-one margin in total contributions. With just two individuals making contributions to Davis’s campaign this cycle it clearly illustrates the voters in the district are fed up with Davis and his irregularities. While Davis spends his time at the Gold Dome going to sporting events and eating meals with lobbyists, Rutledge has focused on talking individually to voters about the issues that matter most to them. Rutledge grew up on a family farm in Henry County, graduated from our public schools and attended Georgia Southwestern University. He has created two successful businesses and raised a family here. He is the former owner of Rover, Inc., a customer-friendly recycling and sanitation firm focused on the people of Henry County. Today he runs Expo-Link Cargo, a firm he started in1999 specializing in trade show exhibits for the logistics industry. Dale is along-time member of the Henry County Chamber of Commerce. On Wednesday June 13, 2012 Rutledge had the opportunity to speak with Congressmen Westmoreland and Broun at the Henry County Republican Women luncheon at the Moose Lodge. “I am very grateful the Henry County Republican Women hosted this luncheon which allowed the Congressmen to be welcomed into Henry County, it was a pleasure speaking with both Congressmen,” Rutledge said. McDonough – June 8, 2012: Republican House candidate Dale Rutledge today announced that he has self-reported a paperwork error that occurred when the campaign’s original Declaration of Intention To Accept Campaign Contributions (DOI) was filed in early February. The error occurred when Rutledge loaned his campaign $7,247 from his personal account even though the DOI had not yet been received by the Commission. The DOI was postmarked three days after the funds were paid. Rutledge is the only candidate in the 109th District Republican Primary that has signed a pledge committing to support legislation limiting lobbyist gifts. He has taken this pledge a step further, committing to self-impose this limit regardless of whether legislation is passed. Rutledge has also committed to sponsoring legislation on the first day of the 2013 session to ban the practice of paying family members with campaign contributions. 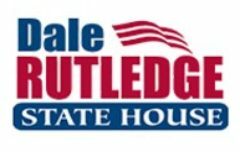 Dale Rutledge is campaigning for State Representative of the 109th district. Dale grew up on a family farm in Henry County, graduated from the County’s public schools and attended Georgia Southwestern University. He has created two successful businesses and raised a family here. He is the former owner of Rover, Inc., a customer-friendly recycling and sanitation firm focused on the people of Henry County. Today he runs Expo-Link Cargo, a firm he started in1999 specializing in trade show exhibits for the logistics industry. Dale is along-time member of the Henry County Chamber of Commerce. McDonough–June 9, 2012: On Tuesday, June 7, 2012 a meet and greet for the Timberridge voters in District 109 for Republican candidate Dale Rutledge was held at the home of Rick and Holly Dubois. The event was an opportunity for voters in the areas to come and meet Dale Rutledge, a candidate for the State House of Representatives in District 109. Rutledge spoke briefly at the event thanking everyone for attending and for their interest in his campaign to represent the taxpayers in District 109.